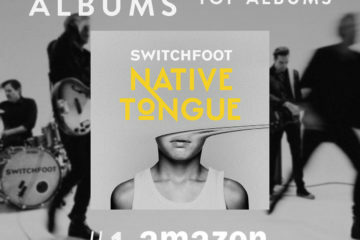 Music industry veterans Switchfoot prove they still have what it takes with their eleventh studio album Native Tongue, another highlight in an already impressive career. Native Tongue has that signature Switchfoot sound, while still showing artistic growth and diversity as a band. Opening track “Let It Happen” starts off dream-like, soft bells striking arpeggios as the electric guitars wind up for a big opening. The drums are a driving force, giving the song forward momentum. The chorus is an admittance that we can cannot control the future. All we can do is live in the present and find the beauty in each moment, trusting that it is God who holds our future. Next up is title song “Native Tongue,” a fun, encouraging, and well-crafted tune. It has a great, catchy melody, and so much going on musically that the listener could listen many times and keep discovering something new. There are some intriguing electronic elements, and the drums keep evolving throughout the song, adding some extra depth. Just when you think the song is over, the music reemerges. There are gentle, quiet piano notes along with a chorus of voices. Jon Foreman’s voice rises above, reiterating the chorus. Lyrically, it’s nothing short of what you’d expect from this prolific band. We’re not born knowing how to spread hate and curses. Love is what comes most naturally, before the shadows of life can dull our native tongue. “Voices” has a bit of a different vibe to it, showcasing the creativity of Switchfoot. The synth has more of a presence than the guitars, and the bass is prominent, especially on the verses, lending a cool groove to the track. This song sings of the inner battle we all face, the choices we have to make, the inner dialogue always running through our minds, pulling us one way or another. “Dig New Streams” offers an array of musical landscapes. It starts very simply with a finger-picking guitar and Jon’s vocals, joined by a warm string section and a celestial harp. This delicate, heavenly moment is abruptly interrupted by the crash of cymbals and drums, lest the listener believe the intro was setting the tone for the rest of the song. Adding to the intrigue, the song includes mixed meters, a horn section, searing guitar solos, and a mix of styles throughout. By returning to our native language of love, that opens up many new streams for us to travel, not being confined by narrow-minded hatred. “Wonderful Feeling” is very aptly named, and sounds like something you might hear from a Californian band. It has a warm quality and gentle melody that leave the listener with a wonderful feeling. There are many references to our wonderful creation and beauty of nature, all pointing to the Creator, our ultimate Source of Light. After this peaceful song, the band kicks it up a notch or ten with rocker “Take My Fire.” The guitars have a heavier presence, and this track features more blistering solos. This song is an anthem declaring that the enemy can never steal our flame, regardless of how strongly the darkness presses in. The record ends with the poignant “You’re The One I Want,” the cello weaving beautifully above the understated piano, allowing Jon’s vibrant voice to shine. This song proclaims dedication, either to one’s significant other, or even to our Heavenly Father. Despite the mistakes and hardships, there are still many more roads to explore in this life, fueled by an unshakeable love giving us support. Native Tongue is a fantastic and well-written collection of songs, a testament to the creative power of Switchfoot. Each member of this band is incredibly talented and they are only stronger together, their bond being forged over many years and many shared experiences. These songs encourage, challenge, and they’re just plain good music, evidence that Switchfoot still deserves to be heard. Join the discussion! What are your thoughts on this post? Stephanie hails from the Pittsburgh, PA area, and is an avid Steelers fan. Her life’s passion is music (especially Christian rock) and helping to promote her favorite bands. She strongly believes in the power of music to share the message of the Gospel and to impact lives, and wants to make sure others have the opportunity to experience that. Stephanie’s favorites bands are Disciple and The Protest, and her hobbies include concert-going, playing alto sax in a jazz band, and underwater basket weaving.